This week I got an email to let me know the dates of when my graduation would be in November. Yes that's right, I'll be officially a graduated adult with a Bachelors (Honours) degree in Visual Communications. This was such exciting news as now I could plan my outfit, hair, etc. and also make sure I had enough money saved up for the night. This also got me thinking of the DIT Graduation show that we had in May of this year, that I never got to write about as I hadn't started my blog at that point. The graduation show was space themed (I know, amazing right? ), this was picked in a sense that we would be blasting off out of college. The title of the graduation show was Lift Off. This idea came from the brains of Sarah McCoy, Grainne Barry Wallace and Alan Harbron. The attention to detail through the whole exhibition was amazing to say the least. As we were in a new building for our final year, in the new DIT Grangegorman campus, everything had to be built and design from scratch, a fresh start. All of the display boards were built and painted from scratch by myself and a few other classmates for the Visual Communications room. The whole show was beautifully thoughtout even to the smallest details. There was lovely wayfinding all around the new campus using large vinyl type, silver balloons were printed on, vaccum sealed silver invites were sent out so it looked like space food, the advertisement and posters printed on reflective silver paper/steel, and there was even a rocket in the middle of the floors. The attention to detail was amazing and the whole show did not disappoint. And the catalogue, such a silver embossed dream! The pace of the book was beautifully thoughtout from the different types of paper to the countdown of page numbers. My favourite part of the catalogue is the images from NASA which subtly break up the catalogue, but which tell a story of a rocket blasting off into space, and ending with the crowds reaction. Genius. I've recieved so many selfies from family members taking photos of themselves in the reflection of the catalogue, which is so much fun! I used my 'Bear and the Night Scares' book as my main piece on my display board for the show and for the side panel I used my Trendy Dublin project. I wanted to show off the main scare in the 'Bear and the Night Scares' book aka the shadows, so I got a huge vinyl sticker of it and had it coming out of the shelf and somehow framing the area where the book is. I also wanted to show off the hero of the story aka the bear, but I wanted to show him to scale and have him somewhere where he would just catch your eye. As this was my only copy of the book, which I handmade myself, I didn't want it to go missing or for the pop ups to get ruined so I encased it in this box and had the torch working so you could see the shadows (sort of, as it was very bright in the studio). I also had photos of the working shadows in the book on the edge so people could see how it worked. 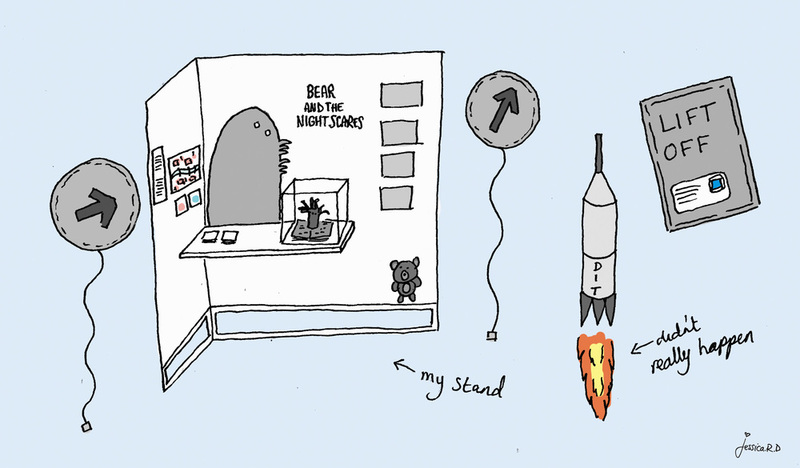 I also had a video of the book with the working shadows opposite my display board so people could see the flick through and how the book works, I also had a pop up bear and the screen too. For the Trendy Dublin I wanted to show off the detailed illustrated map and show how the thumb characters would work around the city. The whole night was a bit of a blur, it all went by so quickly and I didn't manage to get many photos, not even a full outfit shot. As it was space themed I decided to embrace my love for holographic fabric. I got a long pleated holographic skirt from Lashes of London and paired it with silver glittery brogues from Office, a simple white crop top with lace trim from Urban Outfitters, and a light blue cropped denim jacket from Topshop. Lauren Hanley also done my make up for the night which I was in love with, but also forgot to take photos of it. These are all the photos I managed to get from the night but most importantly I got a photo with my inspiration for the book and the main character, my brother Jack.